Watch Sam Dwyer's Peter Daicos-esque Goal of the Week contender. Sam Dwyer brings back memories of a the great Peter Daicos at the MCG as the Magpies steamroll Carlton. Sam Dwyer, seen dishing off a handball against Carlton, has been nominated for Goal of the Week. Sam Dwyer’s rags to riches tale continued on Tuesday morning with the AFL announcing that his goal against Carlton on Friday night has been nominated for Goal of the Week. The 26-year-old gathered the ball on the boundary line late in the third quarter and evaded both Chris Judd and Dennis Armfield before finding space tight on the boundary line. Without much time to think, Dwyer used his left hand to place the ball on his right foot and bounced the ball through for a goal from the unlikeliest of angles. It was Dwyer’s 13th goal in 12 senior games. He was again one of Collingwood’s best players against the Blues, earning 18 possessions (10 of which were won in the opening term) and three tackles from 88 per cent game time. 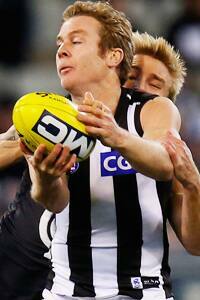 Watch Dwyer’s Goal of the Year contender in the video above before clicking here to vote for him.